‘The most wonderful time of the year’ is quickly approaching. Over the next week or so many of us will skitter into the overheated realms of corporate Christmas in a slight panic, hoping to find the perfect present. This is all rather sad and we might even feel quite sorry for Waugh, having gone to the trouble some days earlier of signing sixteen copies of his travel anthology When the Going was Good to give as Christmas presents. This generally curmudgeonly attitude to Christmas was developed very early on in Waugh’s life, he wrote the following at the age of 16: ‘Like birthdays, Christmas gets duller and duller. Soon it will merely be a day when the shops are most inconveniently shut’. And it continued to the very end of his life, though it seems by 1960 Waugh had accepted that there was little point in complaining about it: ‘Christmas. All that remains of Bethlehem is the breakdown of communications; no room in the inn. We adopted the heathen festivals. We must not whine now that the heathen are taking them back again’. 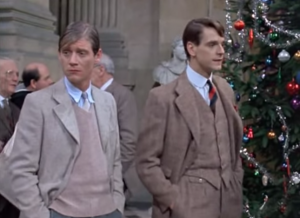 Christmas at Brideshead in the 1981 Granada TV adaptation. ‘A blow, expected, repeated, falling on a bruise, with no smart or shock of surprise, only a dull and sickening pain and the doubt whether another like it could be borne – that was how it felt, sitting opposite Sebastian at dinner that night, seeing his clouded eye and groping movements, hearing his thickened voice breaking in, ineptly, after long brutish silences’. It is interesting to look through Waugh’s Christmas grumblings because they are so consistently melancholic – and having spent the last year trying to reconcile Waugh’s often contradictory statements about art and aesthetics it is rather refreshing, if also rather sad.